While waiting for Mozart's The Magic Flute to begin, I read the notes in the program titled Mozart's Die Zauberflote (Magic Flute) A Masonic Perspective by Tom Ellison, Past Master, Masonic Lodge 712 in California and chorus member of West Bay Opera (Palo Alto, California). I knew that Mozart was a Mason, as were many 18th century luminaries such as Joseph Hayden and Benjamin Franklin, but I didn't know much about the Masons (also referred to as Freemasons). I learned the Masons are one of the oldest continuing fraternities in the world. Their philosophy (with lots of variations) centers around spirituality without being tied to one religion. Freemasonry is not intended to replace one's own religion. There is a moral quest to improve oneself. In the fraternity, all men are treated as equals despite differences in education, class and finances. 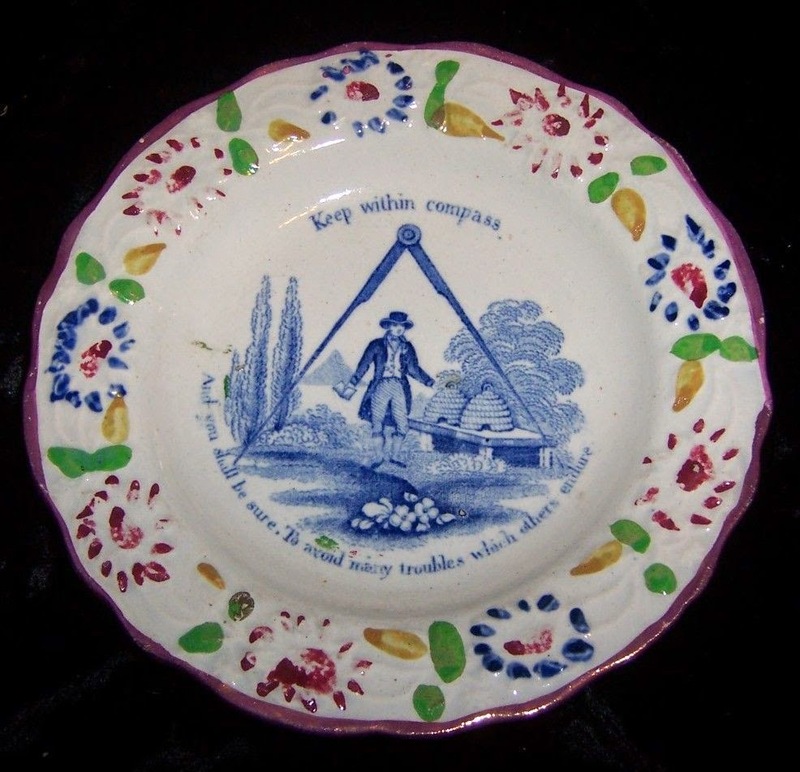 As one thing leads to another, I decided to look for Masonic patterns in the Transferware Collectors Club Pattern and Source Print Database in the hopes of leaning more about the Masons. I remembered that I entered a Masonic pattern in the Children's Subjects Category of the Database. It features a maxim by Benjamin Franklin (remember that he was a Mason) and a large compass (the Masons began as a Medieval Stonemason's guild and a compass was one of their symbols). Along with the compass, other symbols are drawn from the manual tools of stonemasons such as the square, the compass, the level, the plumb rule, the trowel and others. A moral lesson is ascribed to each tool. For example, the compass lesson of Franklin's Maxim: Keep within compass/And you shall be sure/To avoid nasty troubles which others endure is circumscribe desires and passions. The square and the compass joined together is possibly the most identifiable symbol of Masonry. 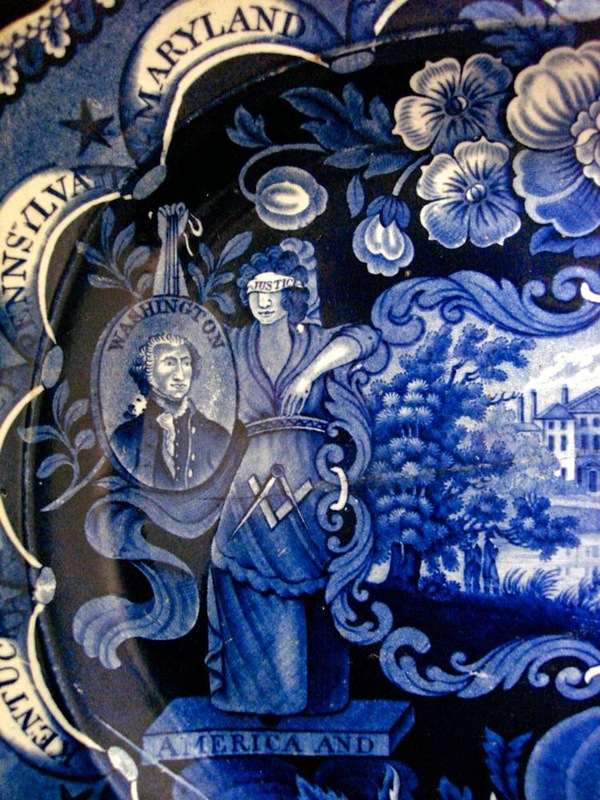 I found the symbol in the border of a States Series platter by James and Ralph Clews (1814-1834). The States Series is an iconic Historical American pattern that celebrates the new United States. The outer border names the first fifteen states to enter the Union and the figures on either side of the inner border depict Justice on the left and Liberty on the right. They stand on plinths that say America And Independence. The square and compass appear on the carpenter's (or stonemason's) apron that is worn by Justice. The square symbolizes squaring our actions with all of mankind (or the Golden Rule) and the compass, as said, teaches circumscription of personal passion. The apron is given to every Masonic acolyte; it symbolizes innocence and aspirations for great achievements. Justice holds a portrait of George Washington who was a Mason. In addition to Washington and Franklin there are other founding fathers who were Masons such as John Hancock, the Marquis de Lafayette, and Aaron Burr (see the list of American presidents who were Masons at the end of this blog). The Masonic philosophy of free thinking and self determination appealed to the early founders of the United States. 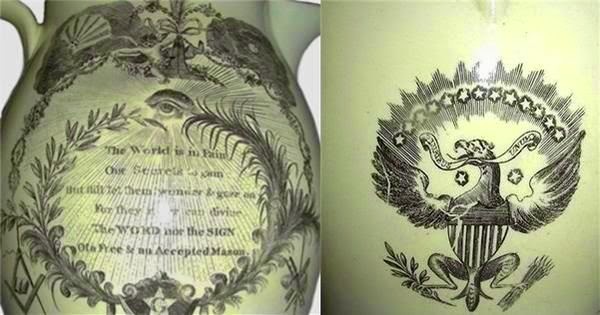 A late 18th or early 19th century creamware jug made for the American Market features the Seal of the United States, Masonic symbols, and the verse of a traditional Masonic song. It illustrates the importance of Masonic teachings to the founders of the United States. Masonic symbols are on one side, the words: The World is in Pain / Our Secrets to gain / But still let them wonder and gaze on / For they ne’er can divine / The WORD nor the SIGN / Of a Free and Accepted Mason are on the other side, and the seal of the United States is under the spout. 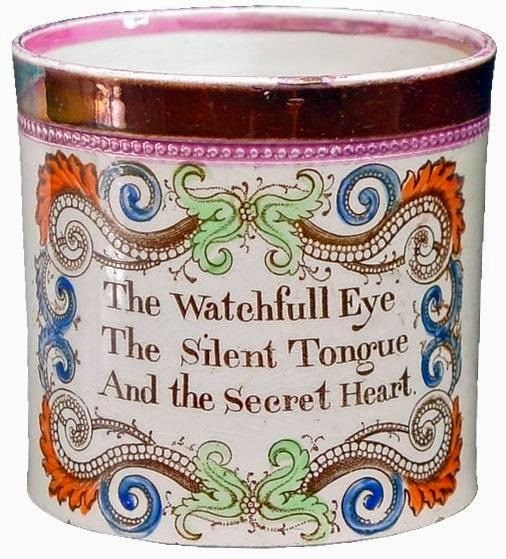 The words on a 3.25 inch mug (perhaps intended for a child), are a variation of the better known A listening ear, a silent tongue, and a faithful heart. These word are used in the ceremony for beginning Masons. According to the TCC database, The Watchfull Eye probably refers to the all-seeing Eye of God which is one of the main Masonic symbols. 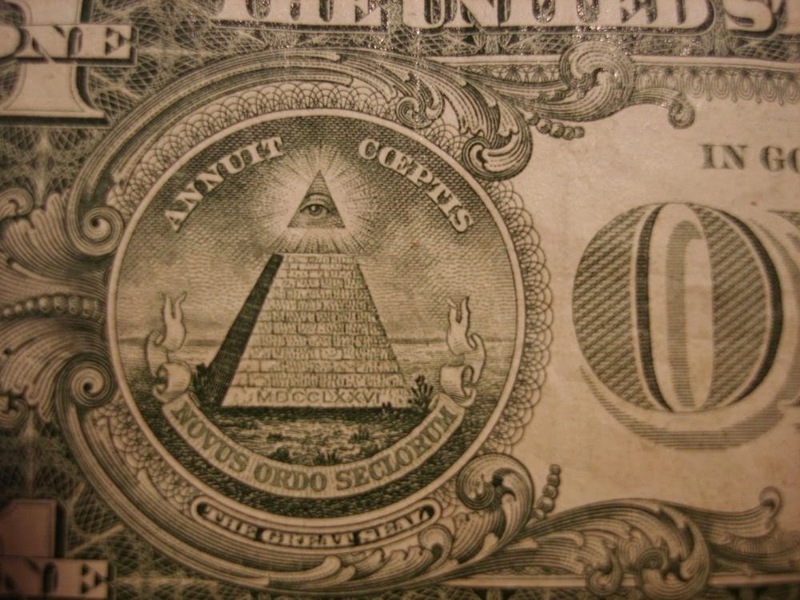 It is found on the back of the American one dollar bill atop a pyramid which is another Masonic symbol. George Washington, of course, is on the other side of the dollar bill. Freemasonry was very popular in the United States, as it was in Britain and Europe. But after the French Revolution, many monarchs were concerned that the Masons' ideas of independence, self determination and equality were the opposites of monarchy and privilege. Many lodges of the Masons were shuttered. Sadly, within a year of Mozart's death in 1791, Masonry was made illegal in Austria. However, the Masons flourished in the United States. This is a circuitous essay, a bit like Pamino's wandering in the forest at the beginning of The Magic Flute. However, as I have said before, one thing leads to another. The use of the TCC Pattern and Source Print Database opened my eyes to the importance of the Masons to the early leaders of the United States. The influence of Masonic philosophy didn't stop in the 18th century. Here are the names of American Presidents who were Masons : James Monroe, Andrew Jackson, James Polk, James Buchanan, Andrew Johnson, James Garfield, William McKinley, Theodore Roosevelt, William Howard Taft, Warren G, Harding, Franklin D. Roosevelt, Harry S. Truman, and Gerald Ford. Look at this link to see more famous American Masons. Thanks for sharing the link. I came to Doctor Syntax via the Clews patterns. 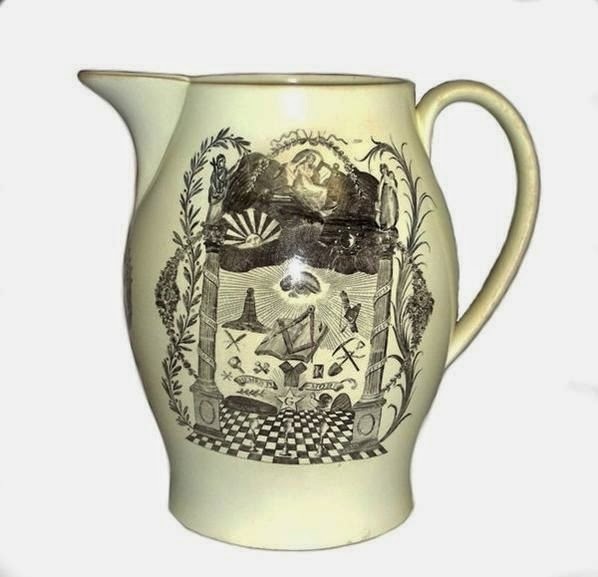 I have been a collector and dealer in transfer printed earthenware since the '70s. 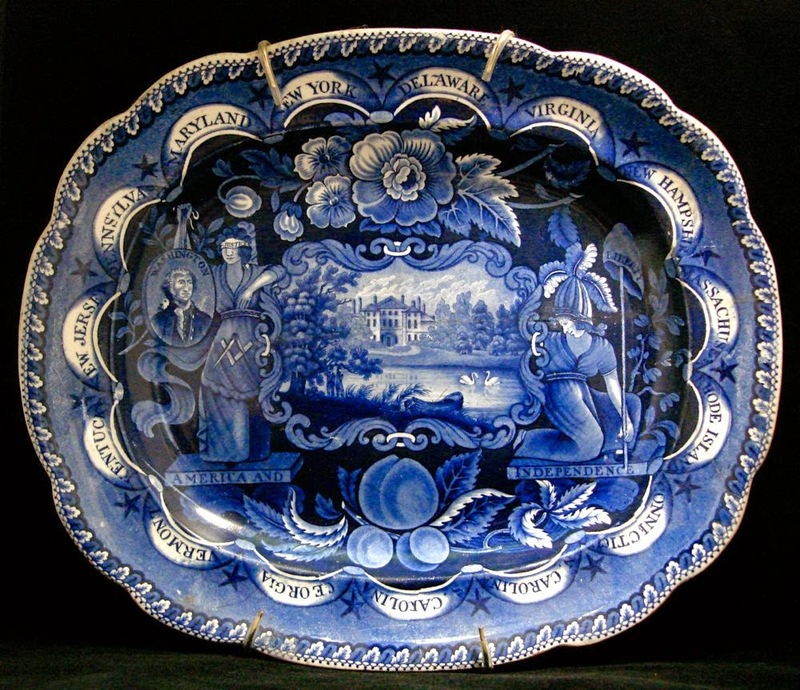 I am an editor of the Pattern and Source Print Database of the Transferware Collectors Club. We have over 11,000 patterns entered plus more than 700 source prints. My great pleasure is finding the source prints that were copied by the potters. I actually did some research on English copyright laws in order to give a talk on transferware animals and their source prints. There are 33 Doctor Syntax patterns in the db. Most made by Clews, but some of the patterns are printed on children's plates with molded borders. I am now following your site. You've probably gathered that I'm interested in eighteenth and early nineteenth-century caricature prints and that I also look into the issue of reproduction of designs across a variety of manufactured goods, including pottery. Is your database of source prints open to public access? Most collectors and academics I know are still reliant on Drakard's book on satirical transfer-prints and it would be interesting to take a look at something as extensive as the records you describe. Our database is only available to members. You could take a look for a 24 hour $10 db only membership. If you are looking for something in particular, I might be able to find it for you. Go to the TCC homepage for more info. The web address is to the right of this blog post.